The Christian faith once meant that a believer responded to a dark world by word and by deed. However, a modern, self-centered church has isolated the faith to a pietism that relinquishes charitable responsibility to the state. The end result has been the empowering of a humanistic world order. In addition, God's great and redeeming power is virtually limited to saving souls from eternal destruction. In Biblical terms, the priority if God's Kingdom first, and all our acts of mercy and benevolence must be in terms of that grand mission. We are God's servants - we dare not expect God to serve our needs ahead of His Kingdom. It is now difficult for the church to recover the Biblical meaning of words like charity and compassion because post-World War II liberalism has redefined them politically into state welfarism. This redefinition has made charity a political tool to retain social order and made the state the primary agency of compassion. Charity is no longer personal. But Biblical compassion flows from our having first received the grace of God and then manifesting it to others. Therefore, Biblical charity - which is compassion in action - is personal: it begins with God's mercy towards us, and then the people of God give expression to that at an individual level. It is in His service that we understand out calling to charity. 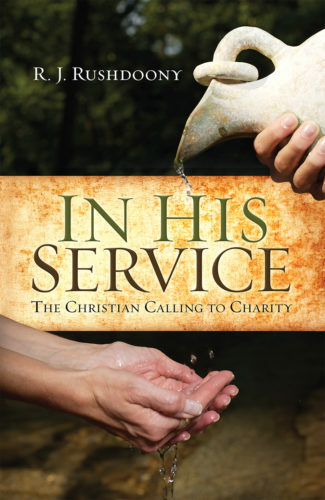 In this book, Rushdoony elucidates the Christian's calling to charity and its implications for godly dominion. In an age when Christian action is viewed in political terms, a return to Christian works of compassion and Godly service will help usher in a return of the reign of God as no piece of legislation ever could.